Heading home? Stop by Krispy Kreme first! When you buy a dozen Original Glazed doughnuts, you get to bring home a 2nd box for only P78. And it only happens once a week! 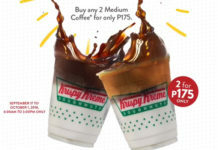 – Download and register in the Krispy Kreme Mobile Application and show digital coupon to redeem 2 dozens Original Glazed weekly. 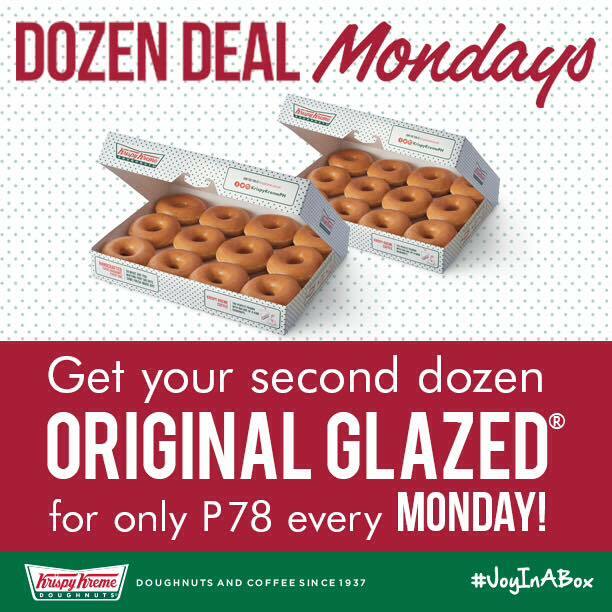 – OR print/screen grab the Dozen Deal Mondays voucher from the Krispy Kreme Philippines’ official Facebook, Twitter or Instagram page and present to the cashier to enjoy this offer. 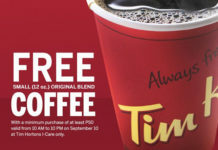 – The Dozen Deal Mondays Voucher maybe used to purchase up to two (2) dozens Original Glazed doughnuts per store. – Valid for dine in, take-out, and drive-thru only. – Promo is not valid with other promotions and discounts. 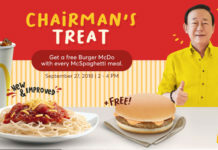 – Offer is valid only on the following dates: August 24, 31 and September 7, 14, 21 & 28, 2015 from store opening until closing.